Although we never close the blinds in the back of our house (the nearest neighbors are across the pond), I'm not a fan of voyeurism. When we purchased Junior, we discovered that the previous owners had removed the privacy curtain and replaced it with window shades--on all front-cabin windows except the door! We immediately put up a shade on the door, and it did not take us long to discover that the shades did not offer 100% privacy. 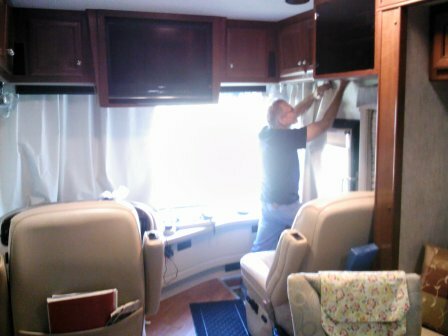 By design, a gap existed between each of the shades, which meant that at night, anybody walking by our parked motorhome would be able to look in and see us, in whatever state of attire we chose. Not a good thing. On our first two trips, we used stop-gap privacy methods: I hemmed strips of blackout fabric, which Jim attached by Velcro to cover each gap. The solution was only marginally acceptable, and we decided to bite the bullet and re-install a privacy-curtain system. We purchased flexible drapery track, the hardware, and blackout fabric. I sewed the curtains. We had to "relax" the flexible track for several days in order to work with it. Today, Jim installed it around the front windows and we put up the curtains I made. I'm happy to say we have privacy again. Any peeping Tom will have to work harder to see inside of our home on wheels. Buying a used RV is like purchasing a previously owned house: You want to put your own personal touches on it. In our case, the "personal touches" mostly address rearranging the dining area and creating a desk/storage area in the interior. That came out very nicely--lots more storage and a place to put the printer, laptop, and external hard drive. We put the finishing touches on this amenity yesterday. Yesterday Jim also replaced the side-view mirrors. When we purchased Junior, we bought it "as is," except for items needing to be fixed that affected safety. One of the side-view mirrors (on the driver's side) was broken. The top half of the mirror was OK; the bottom half, which gave a wide-view of the rear, was missing. 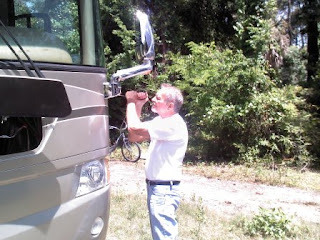 La Mesa, the RV dealer, said it would replace the mirror, since this was a safety issue. We patiently waited. And waited. And waited for it to be sent. After a couple of months, Jim finally followed up and we received it. (Jim said he would put on the replacement, since it would be inconvenient to take Junior to the Orlando-area dealer for installation.) Alas! The mirror was chrome, not taupe. No way were we going to have a mash of mirror colors! When we called the dealer, Jim said we would be happy to return the new mirror, or if they preferred they could replace the other mirror to match the new chrome mirror. They said they would replace the other side-view mirror, at their cost. That was a good thing, because a search for this type of replacement mirror found that they each cost about $750! Yesterday was mirror-changing time. The change-out was easy...just unscrew, unplug, plug in, and screw in. We are back in the side-view mirror business! The next thing Jim wants to do before we head out West again is to put up the solar panels that he had removed from Baby. He is designing a way to adjust the angle of the solar panels, to catch maximum rays when (and if) we do any dry camping. (Not high on my priority list.) The panels will help keep our house batteries charged. Finally, we need to put up our new privacy curtain. For some mysterious reason, the previous owners removed the curtain track (and curtains) and put up window shades. Shades sound like a good option, until you realize that they do not offer 100% privacy, since there are gaps between the shades. So, we ordered new tracking and I made the drapes. We had to allow the flexible tracking to "relax" before attaching it around the windshield. I think it will be ready next week. Our travel plans? Looks like we are going to go back to Yuma/Los Algodones, then head up to the northwest to visit national parks. It will likely be a long trip.